There is an amazing fruit and vegetable stand just across the river from me, called Stanley's. Stanley's has the best prices and the freshest produce I've seen; it's better than a farmers market. You can even find organic there as well. Stanley's is always completely packed, but I walk out with bags of produce for a third of the price I would have paid at a regular grocery store. Truly, this place is a little gem. Last week they had a sale on yellow peppers - you are not going to believe this, .10 cents a pepper - ten cents! They were a small to medium size pepper, but they packed a punch as they were really tasty peppers. I stocked up. So because I have so many yellow peppers I'm using them on everything. 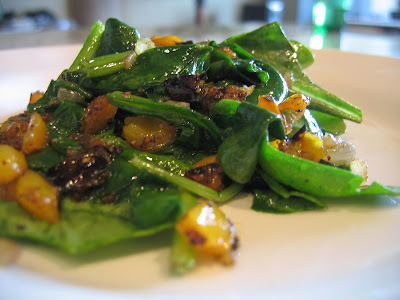 This is a really simple, extremely flavorful little salad, I added butter with the olive oil for more flavor. It could be paired with a meat or fish dinner; in this case, I used it as a brunch salad to go with the Biscuit Egg Sandwich. It's marvelous. If you are in Chicago, go check out Stanley's, get some fresh veggies and be fat and happy! Now add 1 small roasted yellow pepper (see my posting on roasting peppers on your stove top! ), chopped and two cloves of minced garlic. Sautee this until your onions begin to caramelize. Now add about 2 cups of spinach. Toss everything in the pan a few times to coat all the spinach. Leave this on the stove only long enough for the spinach to slightly wilt. Salt and pepper to taste.